The issue was first brought to my attention regarding a Freedom of Information document referring to a woman in the United States Air Force who had become “infatuated with Assange” (rumored to be the now deleted @M_Cetera). According to Archive.org’s Wayback Machine, the page was intact and linked to the document on September 21st, 2018. By October 2nd, the page’s text remained intact but the link was gone. As of this writing, it has not been restored. In another instance, the page for the transcript of WikiLeaks’ press conference on Snowden’s exit from Hong Kong has broken. Since the page’s creation and until at least July of this year, the page linked to the correct address for the PDF. By October 2nd, part of the URL in the link had disappeared – breaking access to the file. As of this writing, the link has not been restored. A third instance involves the transcript of Assange’s secret meeting with Eric Schmidt of Google. As of September 26 of this year, the page was intact and all of the content present. By October 2nd, all content had been removed from the page except for the word “PLACEHOLDER” in all caps. WikiLeaks quietly corrected the issue within hours of my tweeting about it. Strangely, a different page on WikiLeaks’ website also hosted the press release for the transcript – though the actual transcript was missing, and the page’s press release cut off mid-word. It also showed the page’s date as January 1, 1970 – the beginning of Unix time, fairly universally used by servers. As of this writing, the page has not been restored. The transcript remains available at the correct URL. 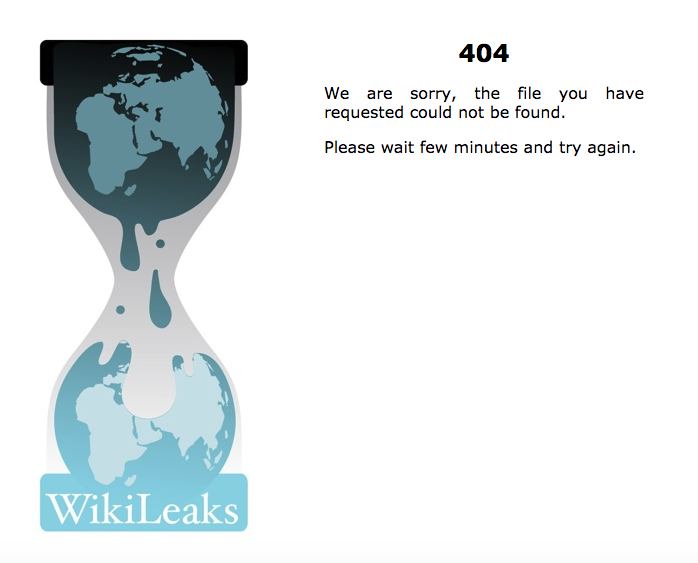 Even the ‘What is WikiLeaks’ page, which is linked to from virtually every page of the WikiLeaks website, links and text that have been mysteriously mangled. In this instance, the HTML code and URLs for two different links have been strangely combined into one. As of this writing, the page has not been restored to its previous state. WikiLeaks’ file repository also seems to have undergone some unexplained changes during this time. As of this writing, the repository shows the directory of Hillary Clinton emails (obtained through a Freedom of Information Act request that WikiLeaks played no part in) as having been last modified on September 25, 2018. (Several days after this, the State Department released new Clinton emails.) This date also applies to most of the subdirectories. The files themselves appear to display the original dates. This could be caused by permissions for the directories being changed or restored from a backup. Due to some of the content being mangled and missing, the latter may be most likely. Also possible is a migration to a new server, though WikiLeaks’ public IP addresses are not new, as of October 3rd. … or maybe changing CMS is not an easy task with a site of that scale. While we also have to improve on security and reliability. I’ve written a brief response to their “lizard people” statement in this thread, also embedded below. C. WikiLeaks is arguing that they’re doing things beyond their immediately capabilities and that they didn’t bother testing and checking things, not even even on https://t.co/cTSY9TNfFz as they have in the past. See point A above. Update: An earlier version of this post listed an incorrect date for the change to one of the pages. While the text was mistaken, the citation and links were correct, and included the correct date. The error does not change the overall timeline of events, and has been corrected. Update, December 11, 2018: Additional portions of WikiLeaks’ website have been found to have broken at the same time. WikiLeaks’ mirror of Cryptome stopped updating during the same time period, and months later has yet to be restored. This portion of the WikiLeaks website does not share a Content Management System, upgrades to which they blamed the broken website. The search interface for the Cryptome mirror continues to superficially work, however it points to files that are not on WikiLeaks’ server due to the broken mirror. Further update: After this post was updated and tweets pointed out the additional errors with WikiLeaks’ website, the organization repaired the Cryptome page. No explanation was offered.